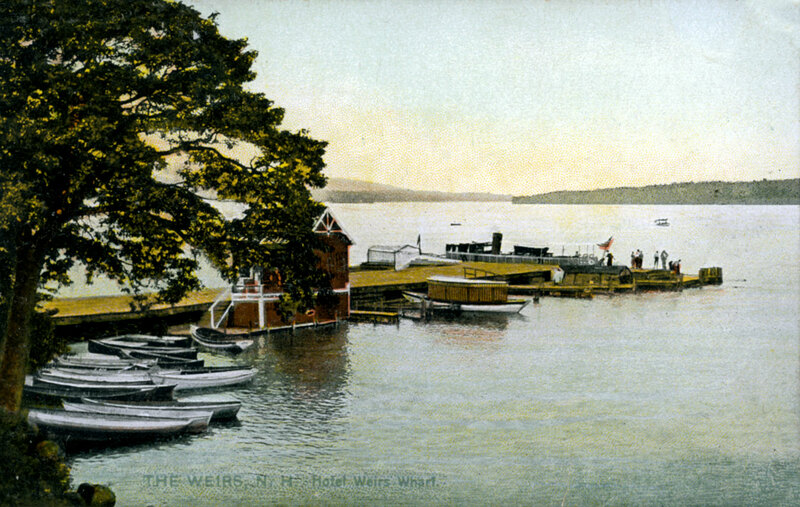 This postcard photo of the Hotel Weirs wharf was taken around the turn of the century. Nearly the same photo as the above postcard. 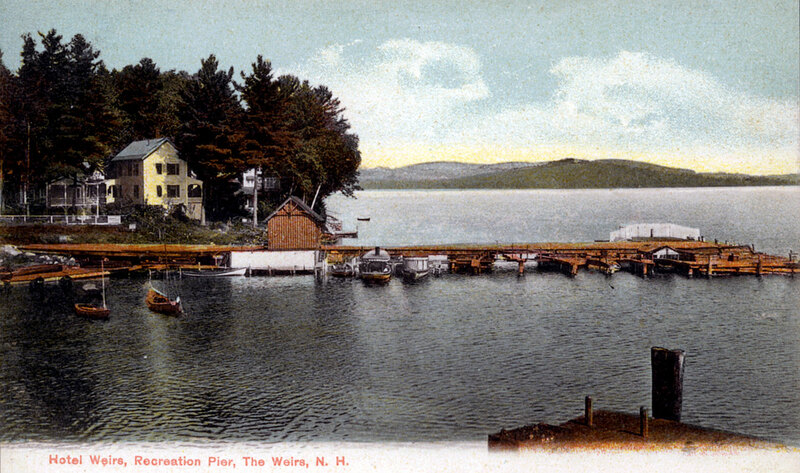 A similar postcard of the time captioned “Hotel Weirs, Recreation Pier, The Weirs, NH”. The term “pier” eventually won out over the word “wharf”. 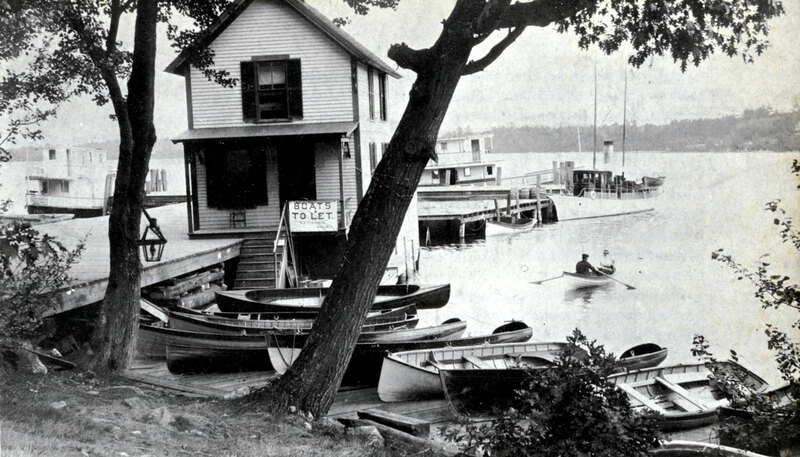 By the time of this photo (circa 1909) a second story had been added to the rental/ticket office on the wharf. In the background, from l to r, are the steamer Cyclone, the steamer Iris, and the yacht Swallow. 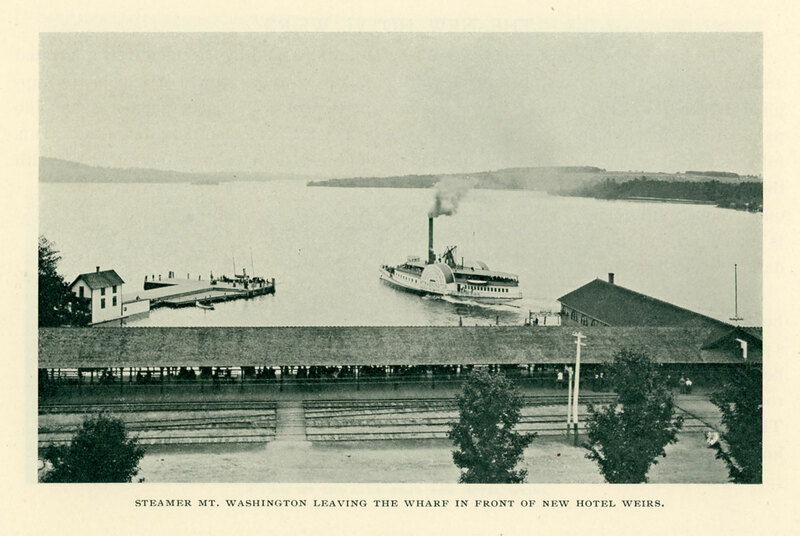 The photo below, dating between 1886 and 1892, shows not only the boats available for rent at the wharf (off the photo to the right), but also, on the left, the drydock for the Lady of the Lake steamer. Above the boardwalk railing can be seen, from l to r, part of the Hotel Weirs; the steeple of the original, 1886-1924 Methodist Church, and a water tower that served steam locomotives until standpipes were installed in 1893. 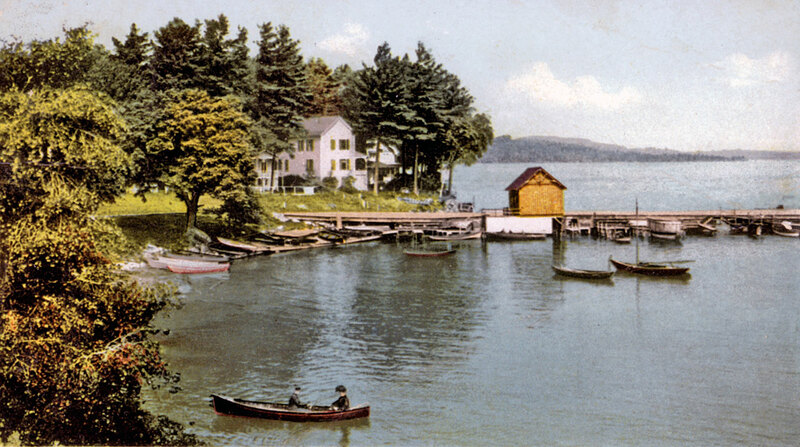 Also in 1893 a long canopy was installed covering the entire boardwalk. Here is an early photo of the wharf, taken before the rental/ticket office was added. A canopy covers part of the wharf. A vessel docked on the far side of the canopy is venting steam. In the foreground, a very narrow dock parallels the main wharf. A similar photo to the above takes in more of the scene. Taken on June 26, 1886, for a religious gathering, a “Salvationist” baptism. 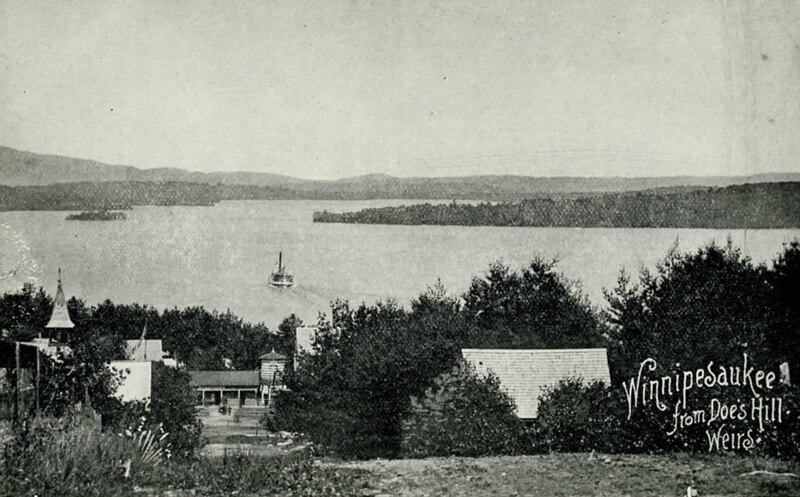 This long-distance photo of the wharf (left-center) is the earliest available, dating from the early 1880’s, and was taken from the 1881-1885 “Orchard View” observatory at the top of Tower St. It seems to show a canopy covering the wharf. 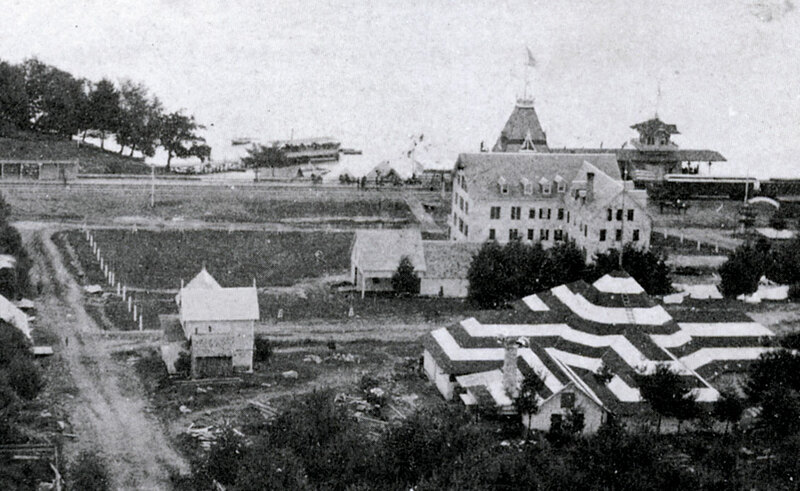 Also seen in the photo is the striped-roof Veterans Dining Pavillion, a rear view of the Hotel Weirs, and rail cars in front of the 1880-1892 railroad station. 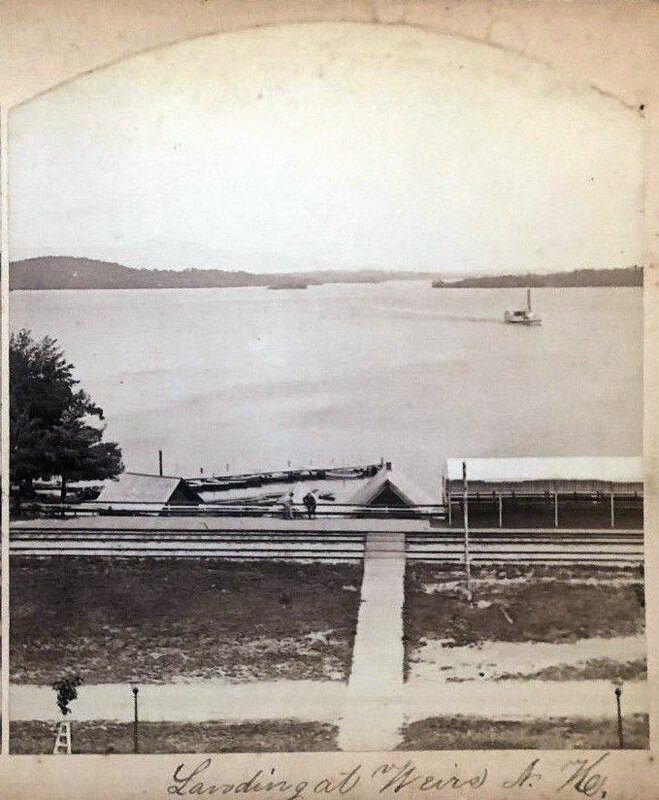 The wharf which extended down in front of the railroad station and serviced the Lady of the Lake steamer is hidden out of view. Here’s an 1870’s view of the wharf when it was nothing more than a simple dock. Note the 2nd train station in the background. From a Kilburn Brothers stereoview, #764, “Depot from Campground (Weirs)”. 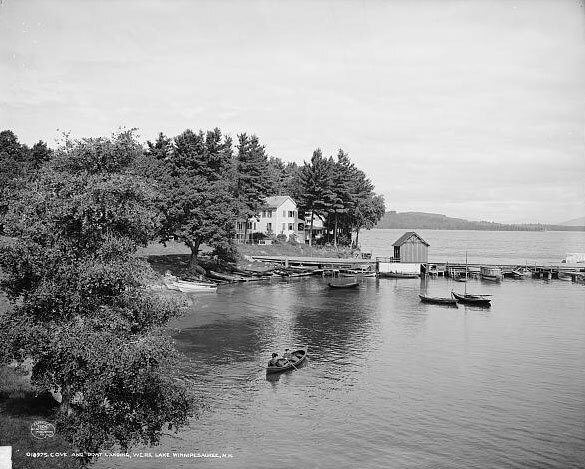 Here’s a circa 1892 view of the boardwalk, water tower, and wharf, taken by the photographer Moulton. The following detail is from a stereoview by F.J. Moulton dated August 3, 1887. 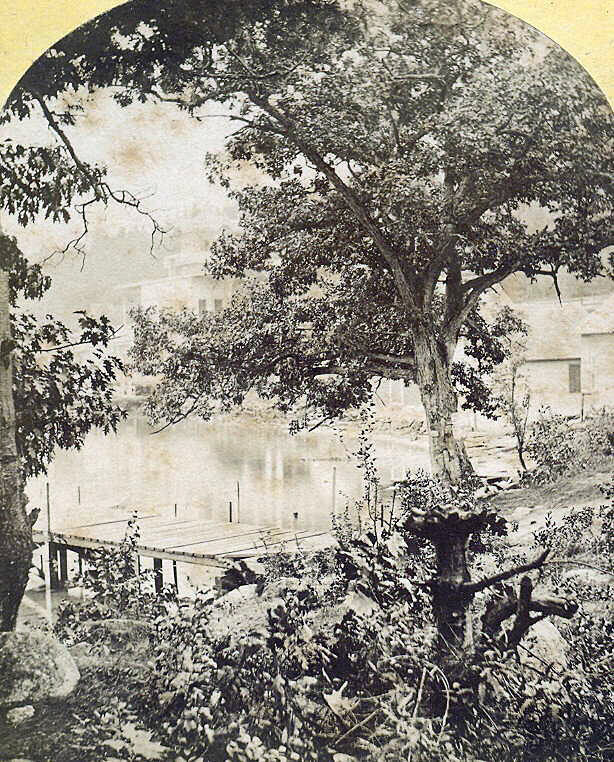 The wharf is seen to be just a simple dock in this stereoview. Another view of the water tower, from an 1892 booklet by the Concord and Montreal Railroad called Lakes, Ponds and Streams on the C&M. The view is taken from Doe’s Hill, now known as Tower Hill. We are looking down a rough path that eventually became today’s smoothly paved Tower Street. 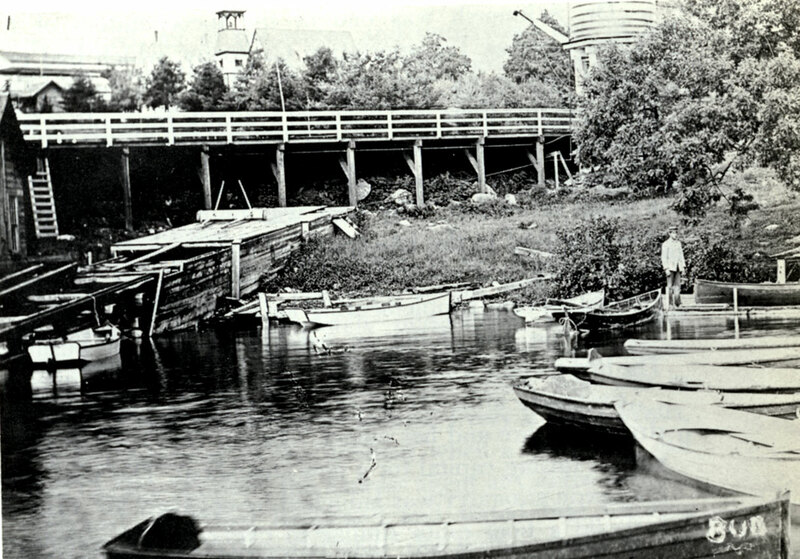 A clear view of the wharf (on left) from around 1905. The caption on the photo is referring to the other wharf (mostly blocked from view on the right), however. Here’s a very early photo of the wharf . 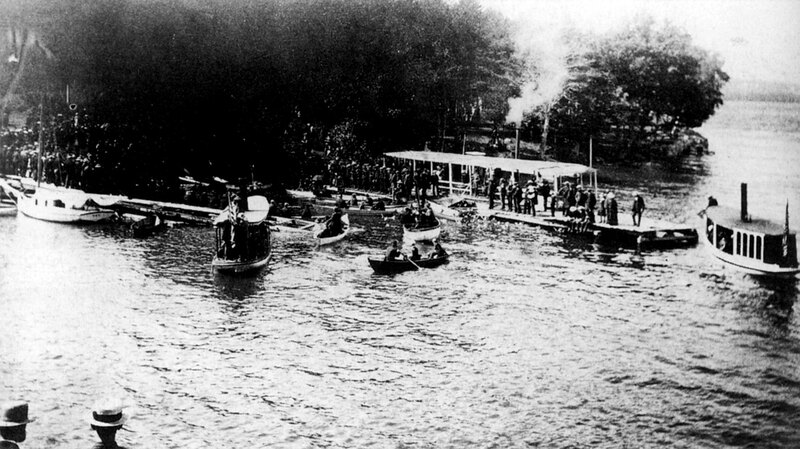 The name of the steamboat is unknown. In the background of the photo, one can see a tent pitched in a cleared area, the earliest photo showing the Methodist campground.